Parkinson’s disease is a chronic, progressive disorder that damages or destroys nerve cells in the part of the brain controlling muscle movement. It is caused by a severe shortage of dopamine, a neurotransmitter that directs and controls movement, and usually affects patients after the age of 50. Secondary Parkinson’s disease may be caused from medications such as haloperidol, chlorpromazine, metoclopramide, or prochlorperazine. MPTP, a heroin by-product, has been documented as a cause of Parkinson’s disease in some IV drug users. If Parkinson’s disease is due to drugs, assign code 332.1. An E-code is also assigned to identify the drug and the circumstances surrounding the administration of the drug thought to have caused the disease. The patient’s symptoms disappear after the drug is stopped. Other sources of secondary Parkinson’s disease include carbon monoxide poisoning, manganese poisoning, hydrocephalus, tumors in the midbrain, and subdural hematoma. If Parkinson’s disease is associated with orthostatic hypotension, progressive supranuclear palsy, or Shy-Drager syndrome, assign code 333.0. Parkinsonism in Huntington’s disease is classified to code 333.4, and syphilitic Parkinson’s disease goes to code 094.82. Dementia with Parkinson’s disease is classified to code 331.82. In addition, assign code 294.1x as a secondary diagnosis to identify associated behavioral disturbances, if any, which include aggressive, combative, or violent behavior or wandering off. Physical therapy may be utilized to improve mobility, range of motion, and muscle tone, as well as relieve stress. While exercise does not stop the disease’s progression, it plays an important role in helping the patient remain as active as possible. A high-fiber diet is also recommended. • Levodopa is transformed into dopamine by the brain. Long-term use, however, may cause side effects such as spasmodic movements (dyskinesia), hallucinations, or orthostatic hypotension. • Carbidopa, which causes levodopa to enter the brain and helps reduce some side effects of the therapy, is sometimes used in combination with levodopa. • Dopamine agonists such as pramipexole, ropinirole, and rotigotine are used as an adjunct to levodopa therapy. • MAO B inhibitors, includes selegiline (Eldepryl) and rasagiline (Azilect). • Catechol O-methyltransferase inhibitors, which prolong the effects of carbidopa-levodopa therapy, include tolcapone and entacapone. • Anticholinergics such as trihexyphenidyl and benztropine are used alone to help control tremors in the early stages of the disease and combined with levodopa later on. • Antivirals, including amantadine (Symmetrel). • deep brain stimulation: a unit implanted in the chest transmits electric impulses through a wire to tiny electrodes in the globus pallidus. The generator codes used to classify deep brain stimulation include 86.94, Insertion or replacement of single-array neurostimulator pulse generator, not specified as rechargeable; 86.95, Insertion or replacement of dual-array neurostimulator pulse generator, not specified as rechargeable; 86.96, Insertion or replacement of other neurostimulator pulse generator; 86.97, Insertion or replacement of single-array rechargeable neurostimulator pulse generator; and 86.98, Insertion or replacement of dual-array rechargeable neurostimulator pulse generator. Assign as an additional procedure code any associated lead implantation into the brain (02.93). Specific code assignment will depend on procedure performed, device used, and documentation provided by the surgeon. Coding and sequencing for Parkinson’s disease are dependent on the physician documentation in the medical record and application of the Official Coding Guidelines for inpatient care. Also, use specific AHA Coding Clinic for ICD-9-CM and American Medical Association CPT Assistant references to ensure complete and accurate coding. — This information was prepared by Audrey Howard, RHIA, of 3M Consulting Services. 3M Consulting Services is a business of 3M Health Information Systems, a supplier of coding and classification systems to nearly 4,000 healthcare providers. 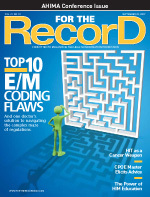 The company and its representatives do not assume any responsibility for reimbursement decisions or claims denials made by providers or payers as the result of the misuse of this coding information. More information about 3M Health Information Systems is available at www.3mhis.com or by calling 800-367-2447.